The First German Baptist Church was organized on September 7, 1849. 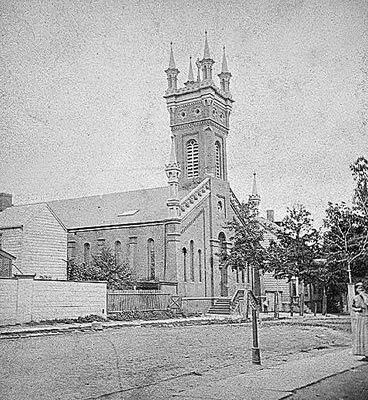 In 1861 the church purchased the former First German Presbyterian Church building, holding the dedication on April 7, 1861. The dedication ceremony featured a sermon by Rev. K. A. Fleischman of Philadelphia. He is believed to be the first German Baptist preacher to come to America, arriving in New York City in March, 1839. The church was rebuilt in 1875. Around 1915 the church became known as the Clinton Hill Baptist Church. It later moved to Morris Avenue in Union. Gives relief to its own destitute members and very frequently to non-members. Has a mission on 16th Avenue and Holland Street. Conducts an industrial school on Friday afternoon and a German school on Saturday.